The esports phenomenon continues to gain momentum with a business expected to reach over a billion dollars in revenue this year, writes Futuresource associate director Chris McIntyre-Brown. This comprises games publishers revenues, media rights, event ticket sales and merchandise, advertising and sponsorship – and the figure is expected to triple over the next five years. With a growing fan base of over 450 million viewers globally, this gaming revolution is as much a ‘sport’ as football and basketball as it involves competition, professional teams, fans, arenas, merchandising and live broadcasts. However, this viewing experience, which originally gained momentum online, is now rapidly transitioning to become one of the world’s largest live spectator sports. Large gaming companies have set their sights on bringing eSports to the big stage (and even the 2024 Olympic Games). Live events hold the potential to create loyal fans, evoke word of mouth advertising and demonstrate the shear scale of this sport to online viewers. Many of the large live eSports events so far have been in existing stadiums and arenas, using a combination of rental and in-house AV to satisfy the spectators and viewers. 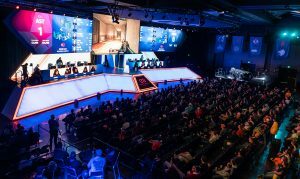 As well as creating an opportunity for rental companies, this ‘stadium hopping’ is also driving venue owners to upgrade and add to their existing display offerings to adhere to the higher technological requirements of esports. With many games now in the limelight and multiple sports leagues per game, the longer-term trend offers an increasing opportunity for dedicated eSports venues. Individual eSports teams are already building dedicated home stadiums, some with extraordinary large AV installations. Whether arenas, e-stadiums, additional university facilities, or converted hotel facilities, the number of dedicated verticals will continue to rise along with market growth – and will even go some way to fuelling the popularity of the sport. When 100 million people are watching a staging event (the viewership of the 2018 Mid-Season Invitational Final for League of Legends), AV installations must make the desired impact, attracting more to the live event, but more importantly raising the standing of the sport as well as the individual games. This all comes with the aim to further generate value from the main revenue stream of online advertising and sponsorship. Due to large revenues available in eSports advertisement, traditional and mainstream content providers such as Sky (with its dedicated eSports channel ‘Ginx Esports’) and the BBC (airing six weeks of eSports last year) are now entering the market. This is further raising the profile of the events, setting a course for even larger productions and impactful AV installations. Many universities around the world now have established eSports teams, playing a wide range of competitive games. However, what is most remarkable is the high production value of the university tournaments and the speed at which eSports is beginning to resemble many other university league sports. This is particularly the case in US college esports, which is showing early signs of becoming a lot like other college sports. Although somewhat lower budget, the viewing spaces required for college eSports are very similar to those seen in independent league matches, with large LED screens in place to satisfy the live spectators and the online viewers. This is evident of the desire of universities to grow the popularity of the sport as well. Benefits would come to the institutions in terms of appearing more technologically advanced and being able to attract tech-savvy gamers and students to their university. Full Sail University recently announced it will be building a new $6 million arena within its campus. This may not be the first university to invest into a sports arena, but the scale of investment being put forward from Full Sail University will have AV installers ready to pounce on the opportunity to fit these arenas. More universities will no doubt follow suit with similar cash investments, which will present a new growing revenue stream for AV equipment manufacturers and installers worldwide.